I recently located a very old computer science paper (1MB PDF) from 1978, it was one of the most significant papers I ever read, it helped me understand the usefulness of computer applications in the arts, and it shaped my career path. With inspiration from this paper, I have always loved to apply modern computer technology to ancient technologies. So I decided to scan my old fading Thermofax copies and put them on the web. This paper discusses an obscure area of Renaissance art, "anamorphosis." Early experimenters in perspective drawing discovered unique optical and geometrical tricks to distort images. 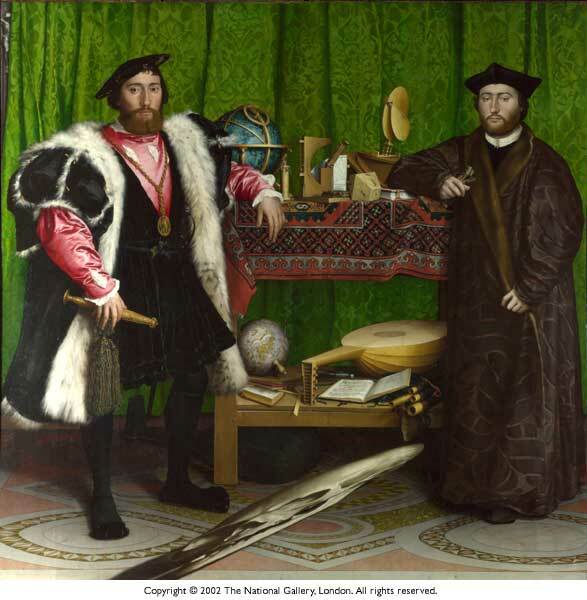 The classic example is the painting "The Ambassadors" by Holbein, it has a distorted image near the bottom, when viewed from a certain angle the image is clearly visible as a skull. Some images were painted for viewing in cylindrical or conical mirrors. Other artists used the technique on a massive architectural scale. 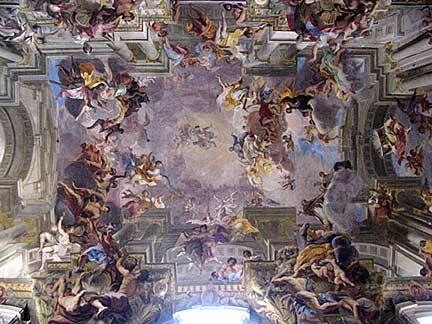 Here is a grand fresco by Fra. Pozzo, it is painted on an arched roof but the architectural features seem to ascend to the sky. It is no wonder that anamorphic techniques were considered "miracles of art." This little paper is one of the first attempts to convert these projective geometry techniques to computer graphics. I encountered this article when I was studying anamorphosis, back when I was a young Art student taking classes in mechanical drawing and perspective. I had some early computer programming and graphics experience with the primitive pen plotters and computer-output-microfilm of the day, but this paper opened up my eyes to new applications. But still, I could not envision the day, today, when I could do these tricks in Photoshop with a Free Distortion or Polar Coordinates filter. In particular, I recommend you print out the last page, and cut out and assemble the little cone. Also notice the strange two-column word processing, which looks like it was done on an IBM Selectric terminal with multiple "golf ball" type elements for italic and regular. You don't see documents like this anymore!